American Duct Tape is the new name for Jaffa! It is a remarkable new tape which is not only thick, strong and 100% waterproof; it also has the most amazing adhesive quality. 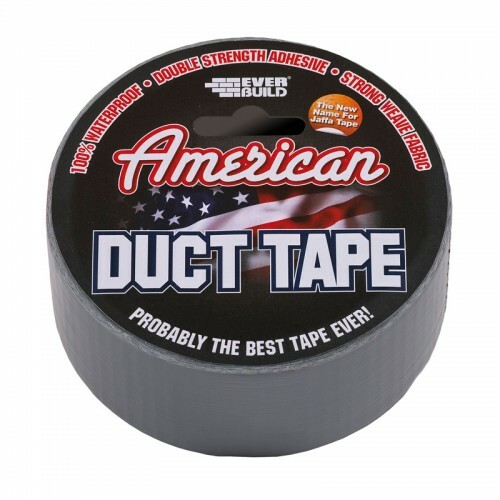 American Duct Tape has a multitude of uses including waterproofing and windproofing scaffolding, windows, doors and exposed roofing – it can also be used on vertical and overhead applications due to its unique hold strength. You can also use American Duct Tape to temporarily hold DPM, timber, guttering, sheet material or any other building material that needs to be held in place without the need to clamp. American Duct Tape will stick to most surfaces and substrates and can be used internally as well as externally.